There are times when even the most hardworking employees would be thrown in a situation that forces them leave their companies and their jobs. Despite the reluctance and capacity for perseverance and hard work, these situations are best solved through the employee’s resignation. One of the most common reasons for such resignation is when an employee’s child or children are in dire need of parental care and attention. Indeed, one’s children are one of the most cherished treasures in one’s life, that’s why, should anything happen to them that require the parent’s immediate and prolonged full-attention, then such a parent must immediately drop all his/her financial concerns if possible and attend to his/her child promptly.You may also see one day resignation letters. 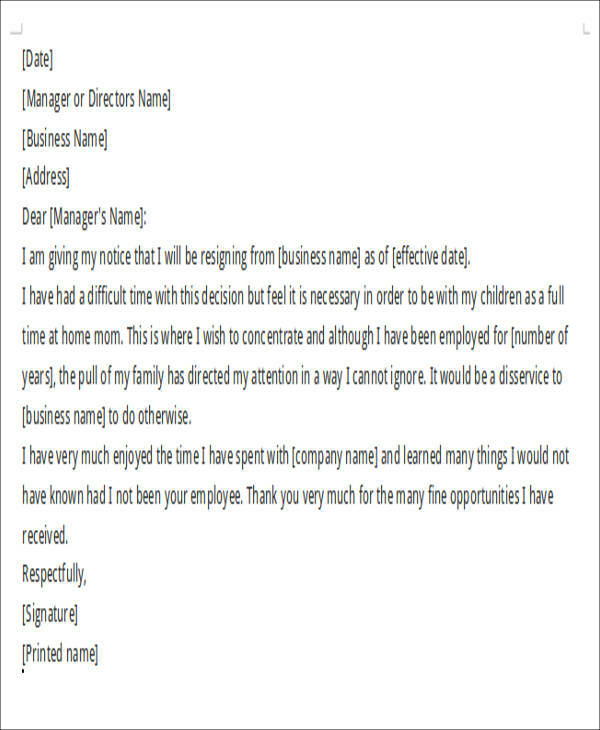 Indeed, child care as a reason for resignation is not a usual one and it is understandable if you are perplexed as to how to write your resignation letter. Well, you need not get confused any further for you have come at the right place. 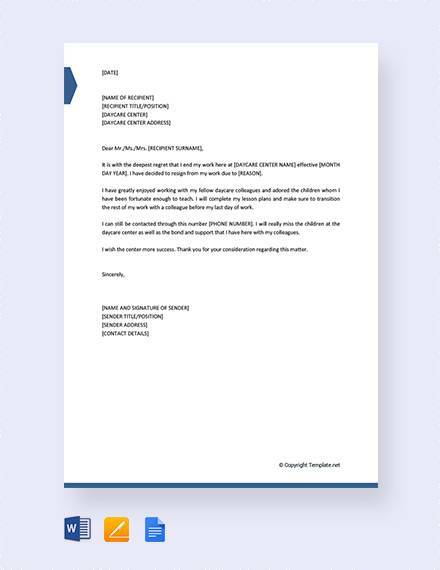 Here at sampletemplates.com, we have collected a variety of childcare resignation sample letters that you can choose from. These are all available in PDF and Word formats thus making it easier for you to access and store it in your devices. You may download our templates for free. Scroll down below and start downloading now! 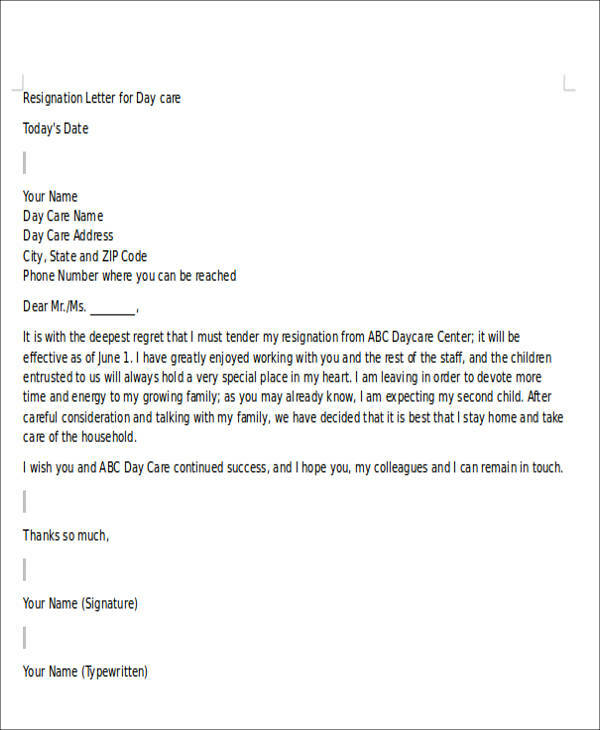 Aside from childcare resignation letters, we also have a collection of the more general resignation letter samples, which are available for free download. Access these by clicking on the link provided. 1. 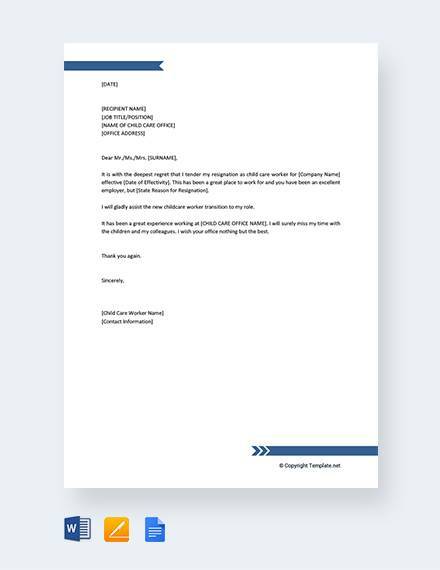 Remember to start your letter in a formal manner. 2. Use legitimately formal titles such as “Mr.,” “Mrs.,” “Ms.,” etc. 3. Clearly state your intention to resign. 4. Explain in detail the condition of your child that necessitates that you quit your job.You may also see manager resignation letters. 5. Don’t forget to express your gratitude toward the company. 6. 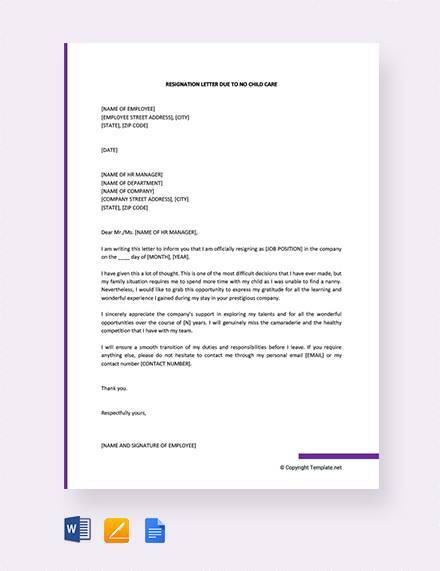 Close your letter formally. 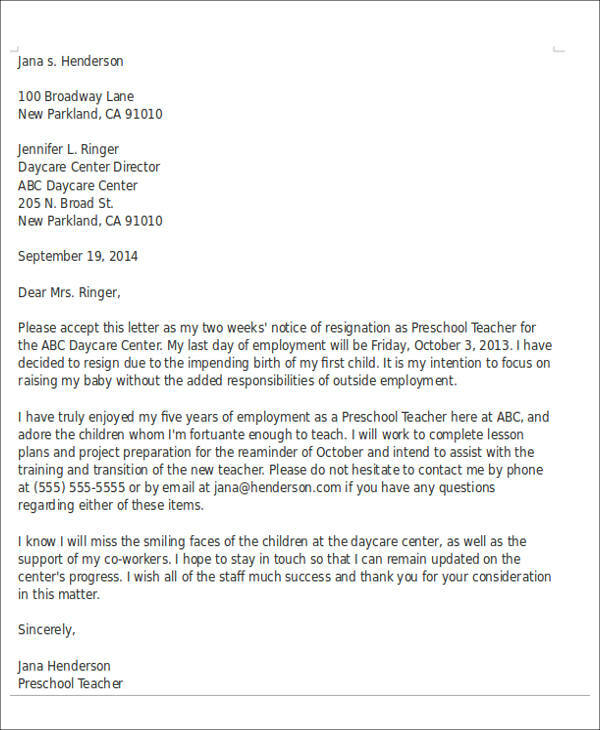 Now that you know the basics of writing a childcare resignation letter, you might also be interested in our professional resignation letter samples. Click on the link to view the collection. 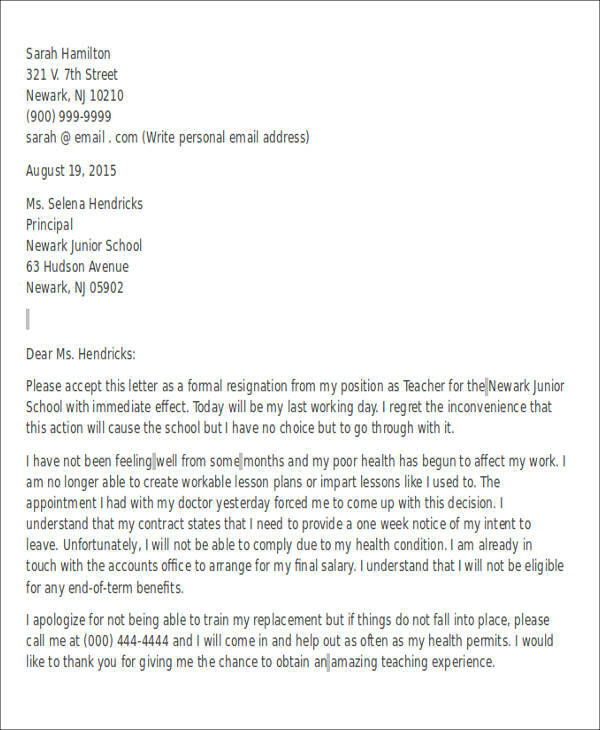 For more resignation letter references, feel free to scour our website using the search bar on our page.